2004 Suzuki Marauder 800. Picture credits - Matt Maher CT. Submit more pictures. Power To Leave The Crowd Behind Leave the cookie-cutter cruisers to the competition. The Marauder is a unique and audacious blend of radical styling and powerful performance. Check it out! Its kicked-out forks - with an incredible 35 degrees of rake - look like they�re straight off a classic cruiser. Now turn your gaze to its flat handlebars, the kind you find on the hottest machines at the drag strip. With its low-profile tires, cast-aluminum wheels, and a load of show-quality chrome, the Marauder is proudly styled like no other motorcycle. Ask questions Join the 04 Suzuki Marauder 800 discussion group or the general Suzuki discussion group. Get a list of related motorbikes before you buy this Suzuki. Inspect technical data. Look at photos. Read the riders' comments at the bike's discussion group. And check out the bike's reliability, repair costs, etc. 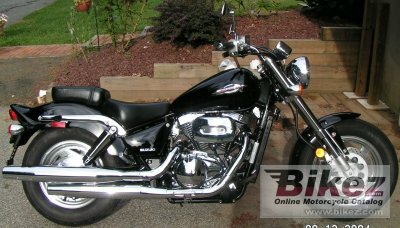 Show any 2004 Suzuki Marauder 800 for sale on our Bikez.biz Motorcycle Classifieds. You can also sign up for e-mail notification when such bikes are advertised in the future. And advertise your old MC for sale. Our efficient ads are free. You are also welcome to read and submit motorcycle reviews.